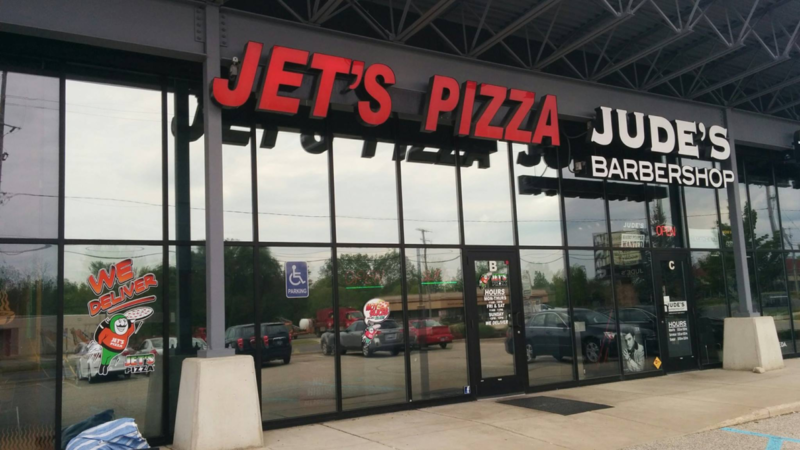 Comstock Park, Michigan – Llumar R20 and Vista V28 dual reflective metallized window film was applied for heat and glare reduction at Jet’s Pizza in Comstock Park, Michigan. Let’s. Get. Jet’s! Whether you are a property manager, a business owner or an office administrator, everyone around you will thank you for installing commercial heat reducing window tinting film. If you would like more information about heat reducing window tinting films and the various objectives they can achieve, visit our Commercial Page on this site or Contact Us today to discuss how we can help you. If you have any questions about window tinting films and how they can be used to save energy, reduce excessive heat, cut glare, add fade protection and improve comfort, give us a call today. You can contact the team at All Season Window Tinting by calling 616.855.4448 for an absolutely free, no obligation consultation and quotation on implementing commercial window film into your facility. Service areas include Traverse City, Grand Rapids, Cadillac, Petoskey, Roscommom, Ludington Michigan and their surrounding areas.